I’m really enjoying performing classical repertoire more actively. Recently, I had the opportunity to perform Victor Herbert’s spoof on Lohengrin, The Magic Knight, with Troupers Light Opera Company. Troupers is a great company in Norwalk, CT and they have high aspirations when putting on shows. I first heard of them through soprano Miran Robarts, with whom I’ve sung before. I figured, “If a company has Miran in it, they must be good.” She’s an amazing soprano—she was cast in The Magic Knight and suggested I audition for “The King” in this 30 minute curtain raiser. The cast was very talented indeed. Alan Briones, tenor, played The Magic Knight. We carpooled to rehearsals several times a week together since he’s down the street in Yorktown Heights. He had the right voice and comic discipline for the role and it was a pleasure working with him. 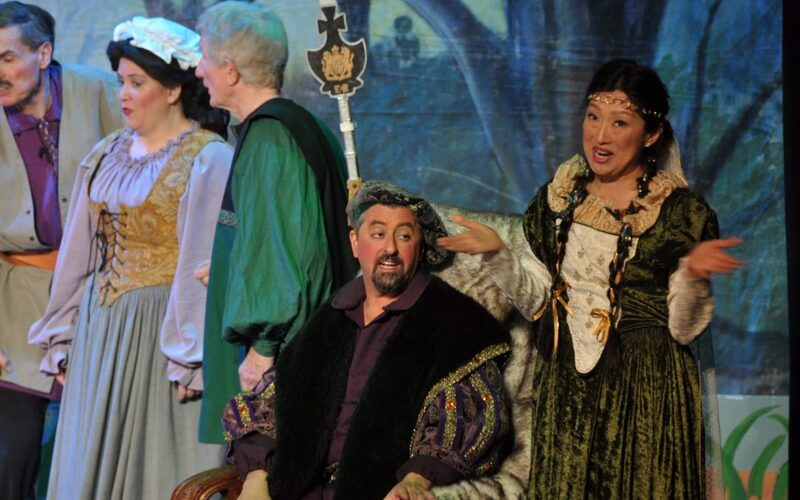 Rounding out the cast were Rob Strom, Nicole McQuade, John Hoover, and a “merry operatic chorus.” It was evident that once everyone learned the score we were going to have a good time with the production. Which we all did! The Magic Knight from Brooke Kroeger on Vimeo.